The best way to start your career is to learn from role models who have already achieved professional success. In our interview series, female trainees from the Burda Journalism School get the chance to do precisely that. This time round, Nina Weber meets Eleni Siakagianni, director of engineering at Cliqz, to discuss the importance of diversity, female bosses and a world without work. Nina: You work at a young tech company. What does your daily work at Cliqz look like? Eleni: My work includes three main aspects: First of all, I spend a lot of time talking to people. Secondly, understanding problems, figuring out what we want to do next and coming up with new ideas is very important in my job. The third aspect I always try to make room for is learning – either about new technologies and trends, business ideas or strategies or about news from the industry. Cliqz started out as a startup. You joined in the early days and have seen the company grow- would you say Cliqz is still a startup? How would you describe the atmosphere? Yes, I would say Cliqz is still a startup. Because the definition of a startup is – at least in my mind - that it is strongly focused on innovation and challenges the status quo. This is all true for Cliqz. But at the same time I think we have become a more mature company over the years. You can see this when you look at the processes and the way people work. This has a good and a bad side. For example, a lot of things are more organized and predictable now. But at the same time, it creates a different atmosphere within the company. Now people are also more hesitant to just try something out for fear of making mistakes and doing damage. What has not changed is that we have very flat hierarchies. How did you become interested in coding and software development? Pure luck (laughs). I was a good student in high school and I read a lot. But I did not have a favorite subject. And I knew I didn’t want to become a doctor or a lawyer or some of the other ‘natural’ choices for good students. Engineering seemed like the next best thing to me. Moreover, my school focused on electrical and computer engineering and we had a really diverse curriculum, including computer science. So, this is how I actually started coding. And I realized that coding was something I really enjoyed. Do you have a role model or someone you look up to? I cannot really say there was or is one single person. Different people have taught me different things. And I look up to different people for different things. That also goes for my colleagues here at Cliqz. We have a lot of very talented people here, some of which I look up to in engineering matters, some are great managers and others are really good at organizing. I try to follow their example and learn from them. Unfortunately, I have never worked for a woman. In general diversity adds to variety and is important for better product decisions, because different people bring different aspects to the discussion. Has your work ever been questioned because you are a woman? Not in a way that was very obvious for me. But if I realize people act differently around me because I am a woman, I usually call them out. So for example someone once called me “bossy. And I said: “Look, you would not tell me that if I was a man. Think about that. “ That feedback was well received. Let’s talk a little bit more about gender-related issues: Your field of work is still dominated by men. What makes you stand out? And do you think women still need to work harder to achieve their goals? It’s true, my field of work is a male dominated one and I think what makes me stand out is actually the fact that I am a woman. Diversity is good for teams and being a woman in an environment dominated by men can be something positive. I think women have a different way of talking to people and a different way of leading a team. So I would say being a woman is almost my USP, right? (laughs) Do I think women still have to work harder? I am not sure. It is hard to tell. But I do think it is not easy in general if you belong to a minority or if you are a person that does not ‘naturally’ fit in with the rest of the group. Being in this position often means you have to work harder. You lead a team of engineers. How did you get there? Is people leadership something that comes naturally to you? Yes, I think it does come naturally to me, but that doesn’t mean it doesn’t involve work. My advantage is that I am good with people. What makes leadership a little harder for me is the fact that I am an introvert. So it takes some effort for me to communicate and talk to people. I learnt that I have to leave my comfort zone at times, because nothing happens by itself. Things happen if I do something to make them happen – it is as easy as that. So it takes consistent effort and practice to become and to be a good leader. It is still something I am working on constantly. Nowadays everyone is talking about the future of work. What does it look like for you? There are two aspects: First of all, younger people – myself included – question work a lot more. And just by questioning why you work and what you want from work you develop a completely different attitude. That attitude changes the way people look for jobs, the type of work they are interested in and the type of employment they wish for. And it is also a reason why people change jobs more often than in the past. The second aspect is the technological one. Many experts are talking about how artificial intelligence will have a big impact on jobs and could take over more and more occupations. I mean... wouldn’t that be amazing? If you could create a world without the necessity of work? Of course that can be a good as well as a bad thing. A world that guarantees adequate income for everyone and gives people the choice to become poets and musicians more easily sounds like a paradise. But one can easily conjure up images of a dystopian future as often portrayed in movies. The first option has real appeal for me. What is the characteristic that helped you most during your career? I do work hard. I like my work. I feel responsible. And it is important for me to deliver good work. That is one thing. Authenticity is also essential! When people feel you are authentic towards them they appreciate it and are authentic towards you. So stay true to yourself. I am actually glad you say that because I feel like we – women especially – are sometimes taught to adapt to existing structures to get promoted in our jobs. So I think that being and staying authentic is very important. Is there something you’ve experienced that the next generation could learn from? Yes. But just because it was a useful learning experience for me, it doesn’t mean it is good for everyone, right? I think we all need to gain our own experience. Getting to know myself, my strengths and my weaknesses was something that has helped me a lot and is something I definitely recommend – take your time to get to know yourself. Take chances as well, if you can! It might not look easy at first sight, but it is worth it. For example, when I moved to Germany, that was a big step for me. But I had a company in Greece that would take me back if I wanted to, so really I had nothing to lose. You also have a startup called Business Crush, right? Tell me a little bit about it. I founded Business Crush together with two colleagues at Burda School of Journalism. It is basically a workshop event for young women starting their career. The first event was in April this year. We invited five coaches who taught the workshop participants things like how to negotiate your salary, how to network or how to find a good work-life-balance. We are passionate about helping young professionals, because we know which issues they face. So, we thought it would be a good way to work with role models who can teach us what they have learned from experience. And the idea worked really well. We got a lot of good feedback from the girls and the coaches. We hope that we can continue our Business Crush events in the future. We want to help young women at the start of their career and support them with our community. That sounds great. What was important for you when you were planning the event? For me it was essential to not only have women as coaches. Because - as you mentioned before – diversity is always beneficial. And especially when you are negotiating your salary you are often doing it with a man. So we felt it was important to have a male coach for the negotiation workshop. In my experience, a lot of panels for women and their career focus on women talking to women. And I think that’s a mistake! We should include men in the discussion and should not create an atmosphere against them. I agree. As a founder, what has been your most important insight so far? I am really happy about the positive feedback we got! Many companies - and even schools – are interested in cooperating. And a lot of young women were looking for workshops like this and were willing to buy a ticket to attend our event. That motivates me a lot! And I have learned that it is actually quite easy to get women together and empower them. Eleni Siakagianni earned a diploma in Electrical & Computer Engineering at the National Technical University of Athen. After developing project-based software for the European public sector at European Dynamics S.A. and two years of pure Java development, she moved to Munich and started working as a software developer at Cliqz. Since August 2014 she is Director of Engineering at Cliqz and leads a team of developers. Eleni believes in aliens and cookies. 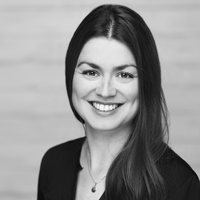 Nina Weber studied communication management in Osnabrück and was a member of the 2016–2018 cohort at the Burda Journalism School. Her training included positions with Elle, Lust auf Genuss and mylife.de. Meanwhile she and two of her colleagues founded Business Crush - a workshop event for young women in the beginning of their career. After completing her training, she joined the Lust auf Genuss food-team as an editor.